Bento.comis a complete guide to Japanese cuisine and eating in Japan. With great recipes, tours of Japanese markets, and tips on the best places to eat, drink and hang out. 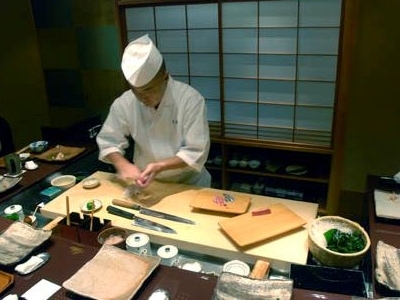 The award-winning Bento.com restaurant guide is the only bilingual source for unbiased, expert advice on where to eat and drink in Tokyo and throughout Japan. Reviews and listings are compiled by an experienced team of food critics who review restaurants anonymously and impartially, seeking out each city's best dining experiences. There is never a charge to restaurants for listings, reviews, or news items, and we don't accept advertising from restaurants. Maki-zushiis made with a bamboo mat, which is used to form strips of tuna, cucumber or other ingredients along with a mass of vinegared rice into long, seaweed-covered rolls. The rolls are then cut into slices. Futo-maki is a variation where the roll is much fatter than usual, and traditionally filled with egg custard, pickled gourd and bits of vegetables.